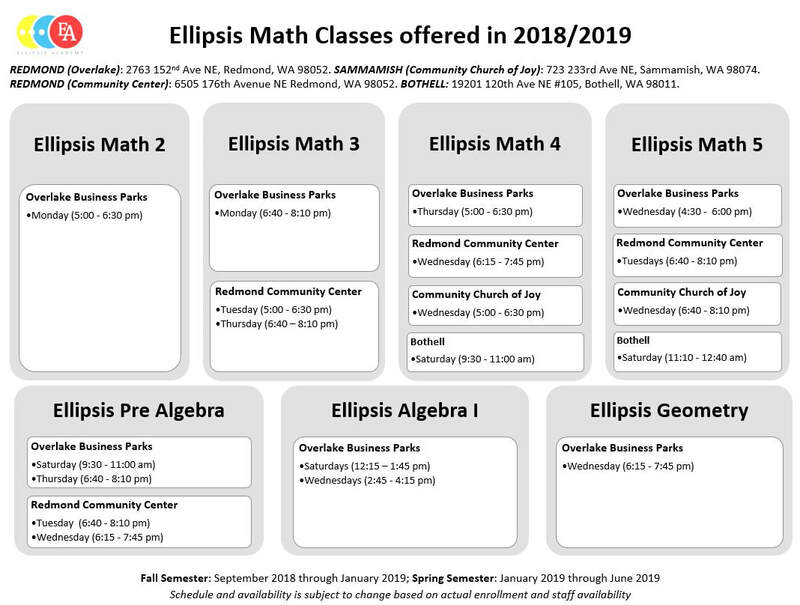 Ellipsis Math programs consist of 2 semesters: Fall semester (September 2018 through January 2019) and Spring semester (January 2019 through June 2019). Each semester is 16 weeks-long. ​Classes meet once a week for 1 hour and 30 minutes. ​Class tuition for Ellipsis Math 2, 3, 4, and 5 is $475 per semester. ​Class tuition for Ellipsis Pre-Algebra, Algebra, and Geometry is $525 per semester. NOTE: If you’ve never been to this Kirkland location before, allow for additional driving time to find this location. Please arrive 20 minutes early for check-in and seat assignments. Pencils and scratch papers will be provided. While students are taking the test, parents are encouraged to attend our open house that we will hold in the adjacent room. During this open house, we will share more detail information about our programs and there will be time for Q&A as well. Space for the open house is limited and seating is on a first come first serve basis. Once we have analyzed your student’s level, we will send out an email containing the Ellipsis Math level recommendation for your student and a registration link to enroll your student to the recommended Ellipsis Math class. Please email Elly Sarwono at Ellys@EllipsisAcademy.com if you have any question.